Hi there! How was your weekend? We had a happy weekend and even though it was just a normal old two day weekend it seemed long and fun. 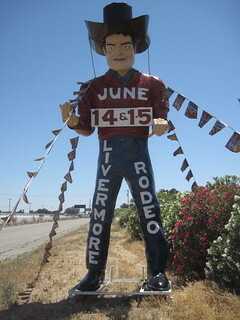 You can tell it's summer now, not just with the advent of some really warm weather, but with the appearance of the Livermore Cowboy out by the freeway in front of the driving range. Crazy town my friends. The guy is enormous and just a little bit menacing don't you think. It's like he's daring you to come into town. And now just for some perspective.. like I said, they guy is enormous. 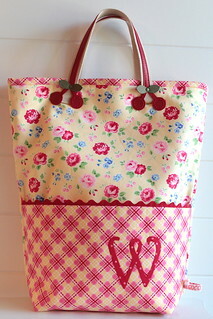 I did a bit of sewing last week.. made a little bag. It's modeled after a bag I made last year, I really liked the shape. Finding those cherry handles where I'd put them for safe keeping was a stroke of luck. I know they're from Atsuko Matsuyama of "The Pink Book" fame and you can find them on etsy, and shops can order them from Emma Creation. I'm really enjoying putting little bits of applique on things. I think it makes for a nice personalized project. I had fun making this and plan on making some more fun things soon. So what are you working on? There's so many exciting projects going on online. Sometimes I just get overwhelmed with how wonderful everyone else's projects are I can't seem to get mine started. Does this ever happen to you? OMG! I love that purse. It is absolutely adorable! And I think the cowboy is pretty handsome! lol. 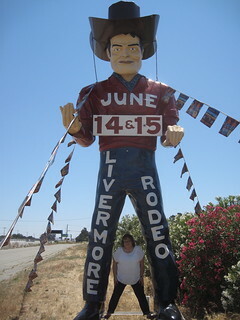 I think that cowboy needs fancier boots! And yes, Instagram can be a bad thing too... I need to think about what I really want to make instead of following the pack! Thre's a really popular pattern that everybody is doing, and I'm resisting. I do understand about the pressures in the craft community. I don't really think anyone intends it to be that way, I know I am always my own worst critic! and this bag is so cute. 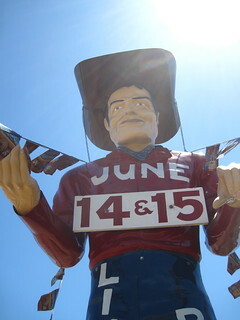 we are headed up your way but not til after the rodeo so I guess we'll miss the cowboy. I will have to ask Annika if her Mom's take her...lol. My daughter will kill me! Love your Rodeo Midas Man. We have a few of those over here in New Mexico. Great bag!